I love the bounty of summer. Fresh green beans, corn and watermelon last week; today fresh blackberries. Our morning started out by a spontaneous decision at about 6:45 a.m. to hurry up and get ready and see if we could get into a local, favorite breakfast spot — Tin Shed Cafe — before the lines started forming. Not only does it have great food, but dogs are allowed on the covered patio and they even have a menu for the pups. So, we got over there about 7:30 and didn’t have to wait at all. I had the Goat Boy scramble and a Passion Fruit Mimosa, T had the Good Boy plate and a Cajun Bloody Mary; and Emma got the chicken and sweet potato bowl (she got a to go box for half of the large portion). They have the best potato cakes that come with the breakfast. While we were out, Terry said that we should go over and see his stepdad, Wendell tomorrow. He lives across the river in Vancouver, WA and it’s been awhile since we’ve stopped by. Since Terry’s mom passed in 2000, I’ve tried to cook up some of Wendell’s favorites to take to him when we go to visit. 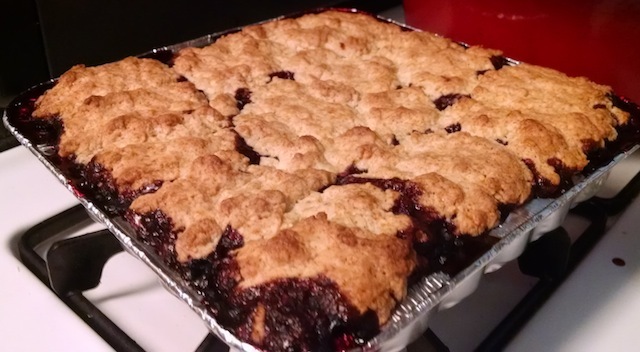 So we decided that I should make manicotti and a blackberry cobbler….hence the fresh blackberries in hand today. I’m also planning on using some of the frozen blueberries to make a muffin that I’ll post about later. Manicotti stuffed and prior to baking. 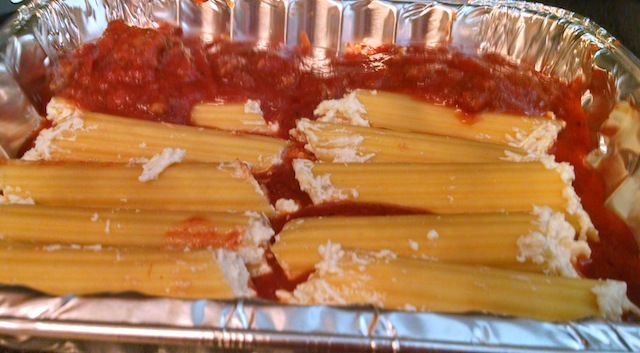 On the other hand, of course the manicotti is not a southern recipe. It is one that I got from a woman at First United Methodist Church in Salem, back in the late 70s; and I’ve been making it ever since. The first time I made it for Wendell he loved it, so it is a standard to take to him now. I make a pot of #meat sauce (see a previous post) and spread a thin layer of the sauce on the bottom of a 9×13 pan (or in this case I used a foil lasagna pan). To make the manicotti filling, I don’t really measure, but this fills 14 manicotti shells: 1 pint of small curd cottage cheese (whatever % of fat-style you like), one 8 oz package of shredded parmesan cheese, one package of shredded mozzarella cheese (or if you have a brick of cheese you can grate it yourself); parsley flakes, salt, pepper, and one lightly beaten egg. Stir it all up together. Then the best way to fill the shells is with your clean hands. Just stuff away and place the filled shells on the layer of sauce. Once the filled shells are tucked nicely into the pan, cover the whole thing with the rest of the meat sauce. You do not have to cook the shells first, by the way. I know the package says to, but seriously, there’s no need and doing it this way you get nice al dente pasta and you don’t have to struggle with trying to fill floppy, cooked pasta. Cover the pan tightly with foil and bake at 400 for an hour. It’s great with a side salad and some crusty french bread, and it’s usually even better on day two.